Cyberonics Inc. on Monday said the United States Food and Drug Administration has approved its Demipulse and Demipulse Duo generators for commercial release. The products are used for vagus nerve stimulation, which is used in the treatment of epilepsy and certain types of depression. In August 2006 Cyberonics saw the FDA reject the company’s application to use its implantable generator to treat depression in patients who do not respond to medications. Mainly due to disappointing results of clinical trials. In the only randomized controlled trial VNS failed to perform any better when turned on than in otherwise similar implanted patients whose device was not turned on. For summary of safety and effectiveness data see this FDA rapport. The pacemaker-like device, which is surgically implanted into a patient, has been available in the U.S. since 1997 as a treatment for epilepsy. 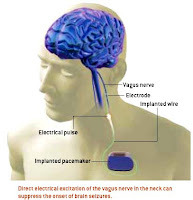 VNS uses a stimulator that sends electric impulses to the left vagus nerve in the neck via a lead implanted under the skin. The left vagus nerve is stimulated rather than the right because the right plays a role in cardiac function such that stimulating it could have negative cardiac effects. The exact method of therapeutic action is unknown, but VNS has been shown to affect blood flow to different parts of the brain, and affect neurotransmitters including Serotonin and Norepinephrine which are implicated in depression. Some patients experience an alteration of voice quality and loudness during the time that the pulse is being delivered to the vagus nerve. Other common side effects include hoarseness, throat pain, cough, shortness of breath. For further eading on VNS please see Wikipedia. For more explanations about the differences between VNS, Magnetic Brain Stimulation and Deep Brain Stimulation, please see this website from Biotele. For more information about VNS see this page from the Mayo Clinic. And this one for Deep Brain Stimulation. My opinion is that efficacy is not proven for these treatments for depression although there are patients that can benefit. Before you try one of these methods be sure they have been treated with all regular options including ECT or electroshock.